Right now, millions of Americans are currently dealing with decayed, broken, and missing teeth. If you happen to be one of them, then Cityview Dental Arts is happy and able to help! When your smile is in need of repair, two of the most reliable treatments are dental crowns and bridges. Our own Dr. Jerry Bock has used them to literally rebuild thousands of smiles over the years. 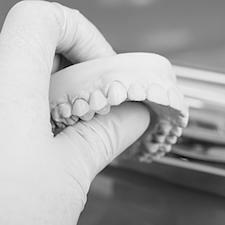 A dental crown is a tooth shaped restoration that simply fits over the top of a damaged tooth. It can be used to improve a tooth’s shape and color cosmetically and/or restore its lost structure. Thanks to modern technology, crowns can now be so precisely shaped and shaded that they are virtually indistinguishable from natural teeth. If you are missing a single tooth or even a few in a row, a dental bridge is a quick and effective way to replace them. It works like this: dental crowns are applied to the teeth on either side of the gap in your smile, and these are bonded to prosthetic teeth that literally “bridge” the space between them. In addition to drastically improving the appearance of the smile, it can also prevent problems such as jaw alignment issues. If you’d like to learn more about crowns and bridges and how you can get one, please contact us today!